Real tennis is off to a winning start in 2016, with Middlesex University triumphing in its first game against Cambridge University. 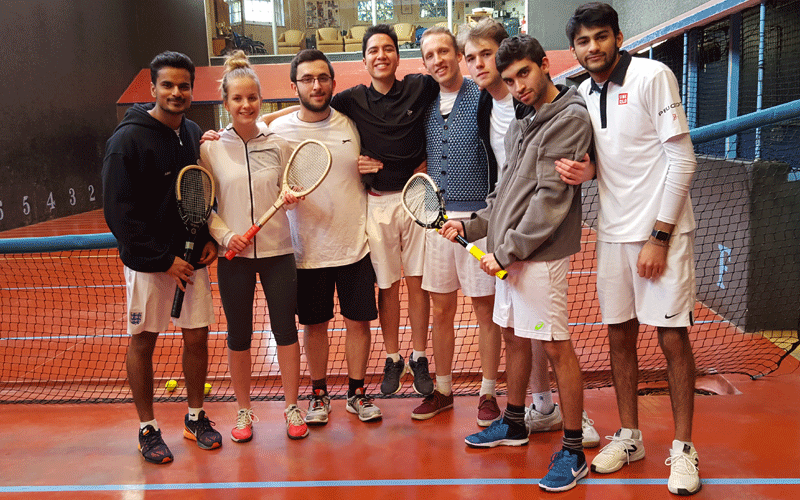 The team of first year students, all of whom began playing real tennis in October 2015, defeated Cambridge’s side 4-0 in a recent friendly. “They all played below their handicaps and surprised the Cambridge team with their positive approach and fantastic support,” said Chris Bray, Middlesex University Real Tennis Club General Manager. The Middlesex players – Abby Chauhan, David Knowles, Josh King, Lennox Johnston, Prab Kang, Aaron Sahabanbu, Asher Ward and team captain Aga Jagielka – are now looking to repeat their victory with further matches against Warwick, Manchester, Durham and Oxford Universities. The Cambridge win sees Middlesex students proudly carry on the legacy of a sport with a long history, which Middlesex has been championing since 2000. “It really is like no other game. We are lucky that we have a court at the University, and it’s right here on campus,” Chris said.